It’s certainly no secret that most of us LOVE sugar! It’s a comfort food with very strong ties to our emotions. Think about it. How do we console ourselves when stressed? Or celebrate our successes? Ever bribe a child with cookies? Cheer up a sad friend with ice cream? But is this a good thing? I would argue, no. Let’s test your sugar knowledge with a fun, short quiz. Don’t fret! It’s only five questions. #1 How many teaspoons of “added” sugar does the average American consume daily? According to Alice G. Walton, the average adult consumes at least 22 teaspoons of sugar per day, over 130 pounds in one year (and this is a conservative estimate). The average child ingests 32 teaspoons per day, an even scarier fact. #2 What is the recommended daily amount for sugar, according to the American Heart Association? Side note: a typical twelve-ounce soda contains 10 teaspoons of sugar. One drink = 40 grams of sugar! #3 What percentage of food items on our grocery store shelves have added sugar? 75-80%. Shocking, right?! You’ll find sugar in spaghetti sauce, ketchup, breads, barbecue sauce, canned soups, salad dressings, baked beans, canned and dried fruit, cereals, granola bars, sports drinks, instant oatmeal, yogurt, jelly and jam. Sugar is everywhere! Read your food labels and be an educated consumer. #4 The food industry is quite tricky. How many different sugar ingredient names are used? I’ve compiled a non-exhaustive list of over 50 names used to label sugar, including (but not limited to) high fructose corn syrup (HFCS), brown rice syrup, malt syrup, fruit juice concentrate, evaporated cane juice, beet sugar (likely genetically-modified), palm sugar, fructose, maltose, sucrose (table sugar), glucose, and dextrose. Not to mention all of the artificial sugars (sorbitol, aspartame, erythritol, lacititol, maltitol, mannitol, saccharin, sucralose). Pack a detective hat on your next grocery run! #5 Sugar is as addictive as cocaine. True or false? False. Sugar is actually MORE addictive than cocaine (some say eight times more). Current research shows that sugar is the #1 food or drug that we are addicted to. The same brain pathways that are activated when we consume cocaine are activated when we ingest the sweet stuff! Nicely done! You all passed with flying colors. We know that sugar (a “legal drug”) is extremely addictive, but did you know that the food industry spends BIG research money to create products that hack your brain chemistry and keep you addicted? Their methods are very effective, too. Breaking the sugar habit can be quite tough and goes beyond self-control and willpower. Maybe you can relate to the difficulty of resisting certain foods that we know are bad for us? You can do anything you put your mind to, but your taste buds and your brain have literally been hijacked by the added sugars in processed foods (even the ones you think are “healthy”). Sugar gives us an instant boost because it triggers the “feel-good” brain chemical serotonin, which is responsible for feelings of happiness and well-being. Our bodies then crave this substance’s influence on our brain cells. But guess what? Many healthy foods and habits can boost your serotonin levels, like eating bananas, leafy greens, walnuts, oats, and green smoothies. Soak up some sunshine, laugh more, take a walk, enjoy some yoga, and get outside in nature. So, what’s the good news? With a little awareness and dedication to raising our standard for health, we can take back the reigns and make better choices with what we buy, what we consume, and how we bake. For more information, check out my eBook “Simple, Gluten Free Dessert Recipes” featuring many of my best (and nourishing) sweets recipes, handy baking tips, and savvy info to help you take control of your sugar intake NOW! You can also find low-sugar recipes at mindfuldine.com. Sending out good vibes from my kitchen to yours. Let’s go bake! Living la Vida Bluff Style! 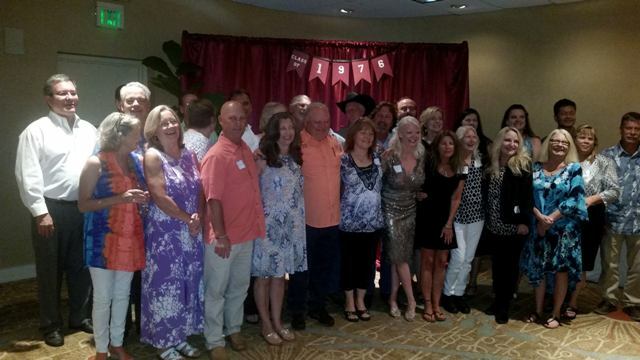 I guess taking part in my 40th class reunion made me a bit nostalgic concerning my hometown, Flour Bluff. It is a little community of about 20,000 fiercely independent people that sits on the Encinal Peninsula between Cayo del Oso and Laguna Madre. On Aug. 5, 1961, the City of Corpus Christi, Texas, voted to annex Flour Bluff while Flour Bluff voted to incorporate as a separate city. The Corpus Christi City Council passed an annexation ordinance, and city police began patrolling in Flour Bluff. 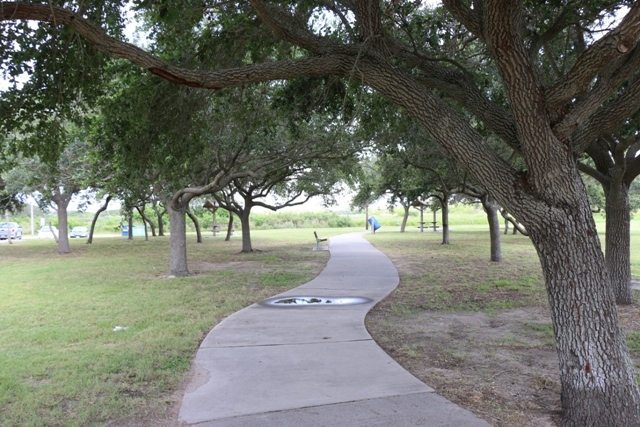 Suits filed by Flour Bluff residents to block annexation were appealed to the U.S. Supreme Court, which ruled that it did not have jurisdiction in the matter. 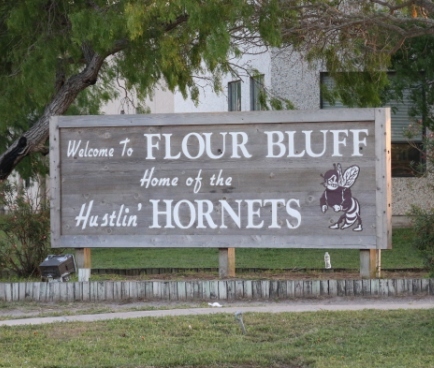 Even though Flour Bluff officially became part of Corpus Christi, the people don’t really seem to know it. That’s why most Flour Bluffians say they are “going to town,” when in actuality they are simply crossing one of the two Oso bridges into Corpus Christi proper. 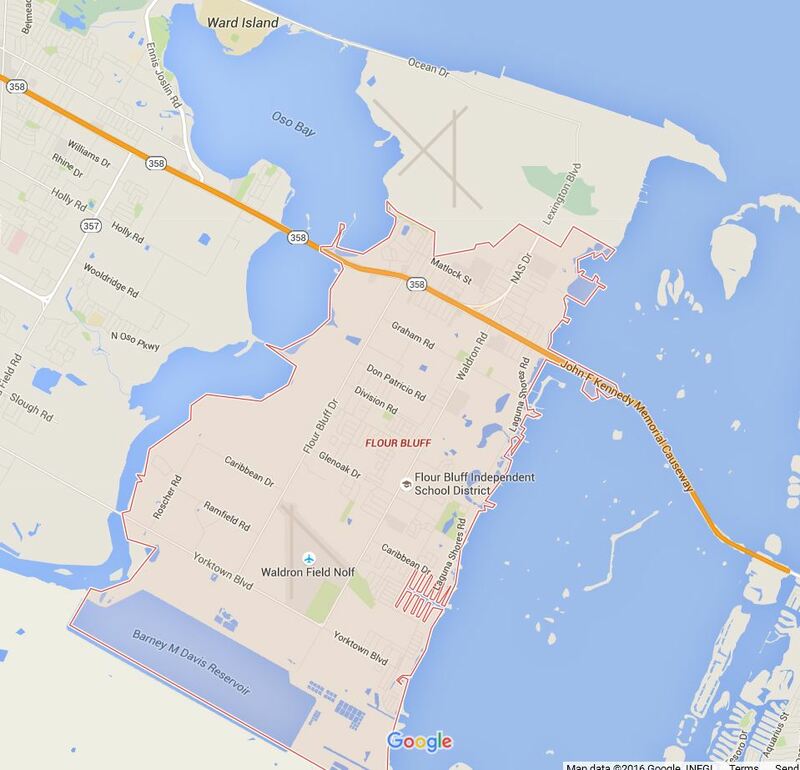 Once known as the “Gateway to Padre Island,” Flour Bluff is home to the award-winning Flour Bluff Independent School District and Naval Air Station Corpus Christi, the two largest employers in the community. These two entities have supported each other since World War II when the Navy commissioned the base in 1941. 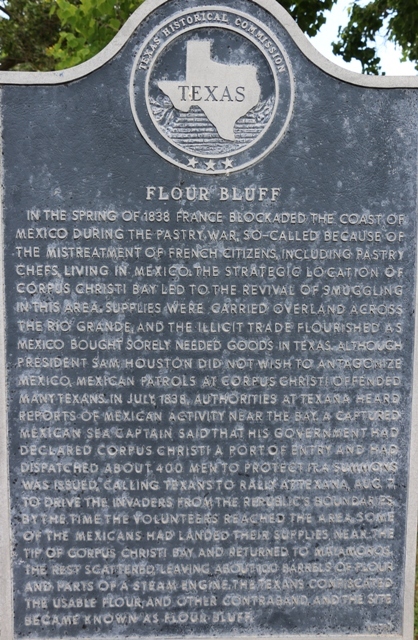 Flour Bluff, like many Texas towns, was influenced by ranching and oil and gas. Add to that tourism, highlighted by fishing, boating, birding, and water sports, the diverse nature of the community starts to take shape. An aerial view of Naval Air Station (NAS) Corpus Christi, Texas, as it appeared on January 27, 1941. The air station was commissioned in March 1941. 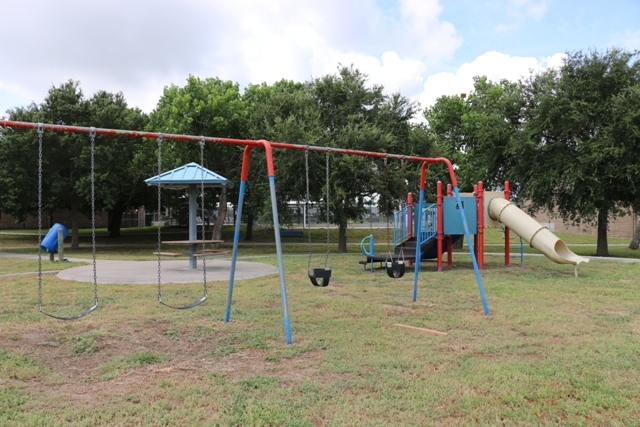 The first school was opened in 1892 in the community of Brighton, later to become Flour Bluff. 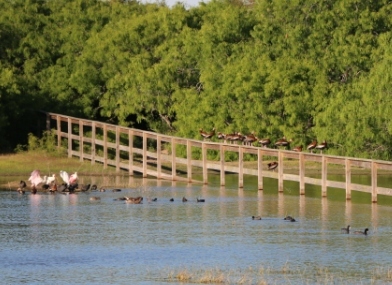 Flour Bluff is home to countless species of birds. It is possible to live and work in Flour Bluff and never leave except to visit a major hospital, which is just five minutes away. Flour Bluff has its very own HEB Plus and Super Walmart along with a host of unique shops and businesses that meet the everyday needs of the people. It has an active business association, three fire stations (federal, county, and city), a police substation, various banking institutions, eateries of all types, and even a brewery! Add to this three quick-care clinics, local dentists, a vet clinic serving large animals and small pets, accommodations for out-of-town guests, a twenty-four hour gym, multiple auto mechanic shops, storage facilities, car washes, insurance companies, attorneys-at-law, and a host of other businesses that offer the citizens of Flour Bluff basic amenities of life. Of course, churches of all denominations and community organizations enrich the lives of the people, too. If a person wants something more, indoor and outdoor malls are within a ten-minute drive east while the Gulf of Mexico is ten minutes the other direction. 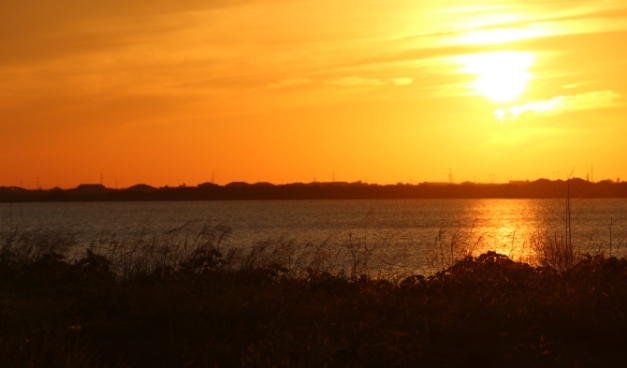 Padre Island sports the longest stretch of undeveloped, drivable beach in America (60 miles). 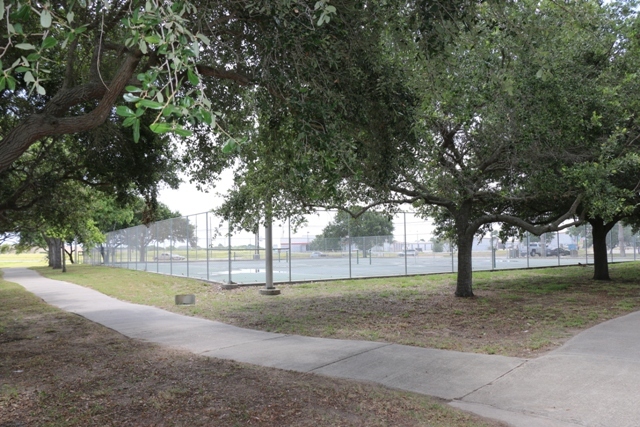 Del Mar College, Texas A&M Corpus Christi, and the Craft Training Center provide educational opportunities beyond high school and are all under a 20-minute drive from Flour Bluff. Living in Flour Bluff comes in all shapes and sizes. The community offers many housing choices – including affordable housing, and multiple realtors in the area are available to assist newcomers in finding the perfect home. 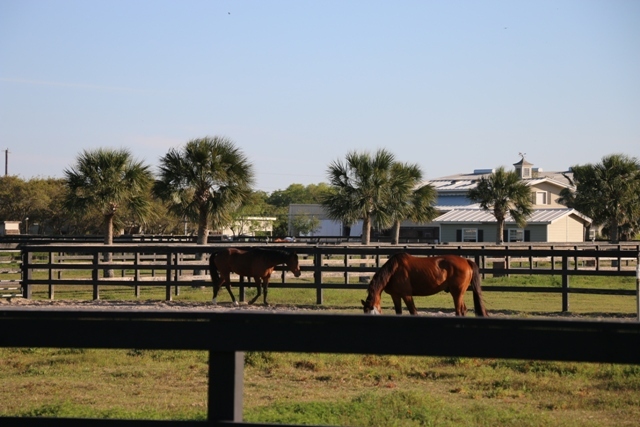 Some residents in Flour Bluff enjoy the rancher’s life and own large pieces of property with room for horses and cows. Others love living on the water. 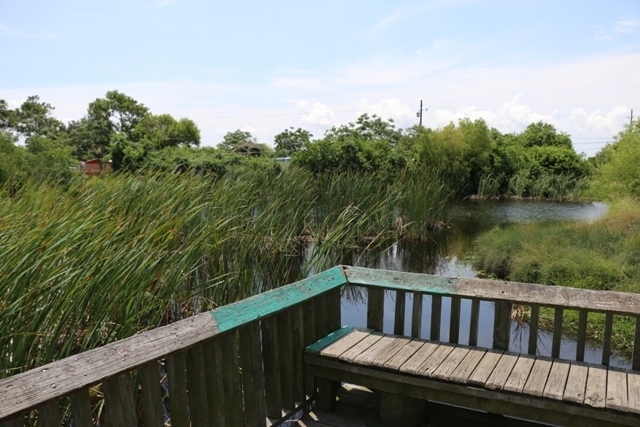 Waterfront properties are available along Oso Bay, Laguna Madre, and parts in between where ponds and canals exist. 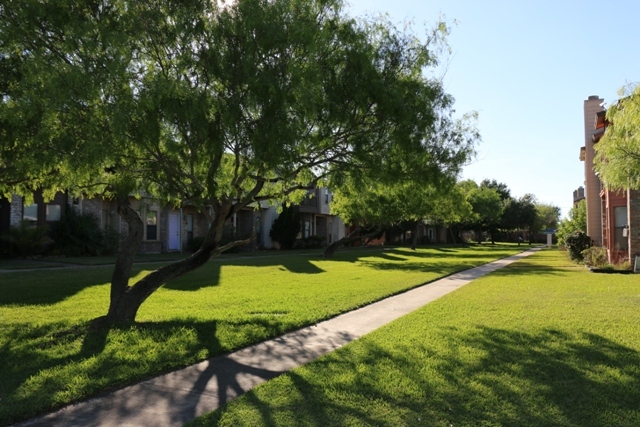 Many people prefer little or no yard maintenance and live in single or multi-level apartments or condominiums. 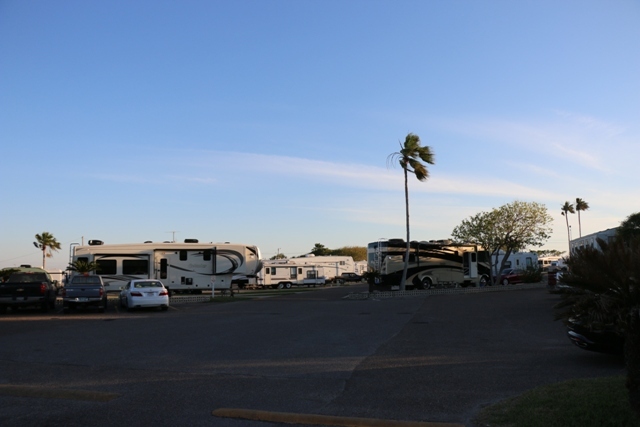 Flour Bluff welcomes its friends from the colder parts of the country in the many RV parks in the community. Most residents, however, live in quiet neighborhoods filled with the whir of lawnmowers and the laughter of children. Yes, there is indeed something for everyone! 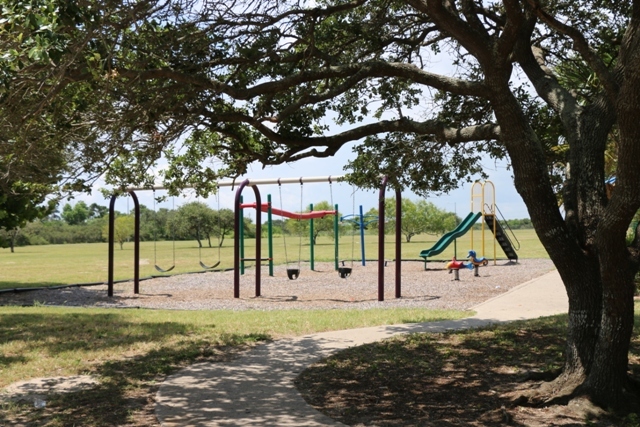 Flour Bluff offers many outlets for family fun. 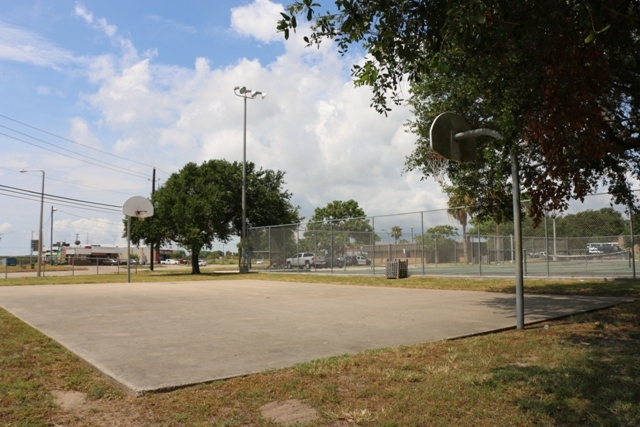 The community has a public and school pool, little league softball, baseball, and kickball fields, youth football organizations, activities at Flour Bluff Schools (i.e. 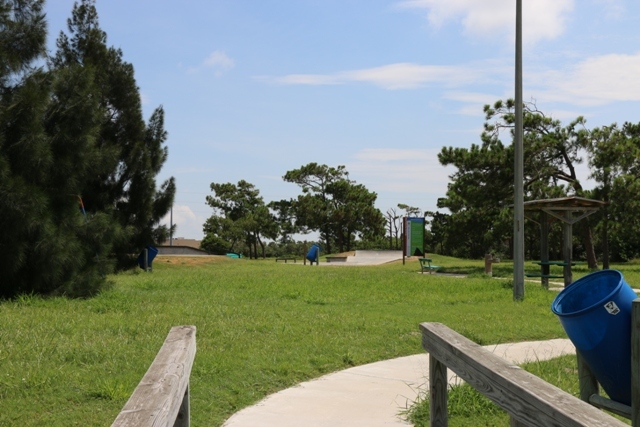 basketball, football, volleyball, softball, academics, arts, music, NJROTC), a skateboard park, a disc golf park, multiple playgrounds, and other facilities for activities such as martial arts, soccer, tennis, rugby, and horseback riding. 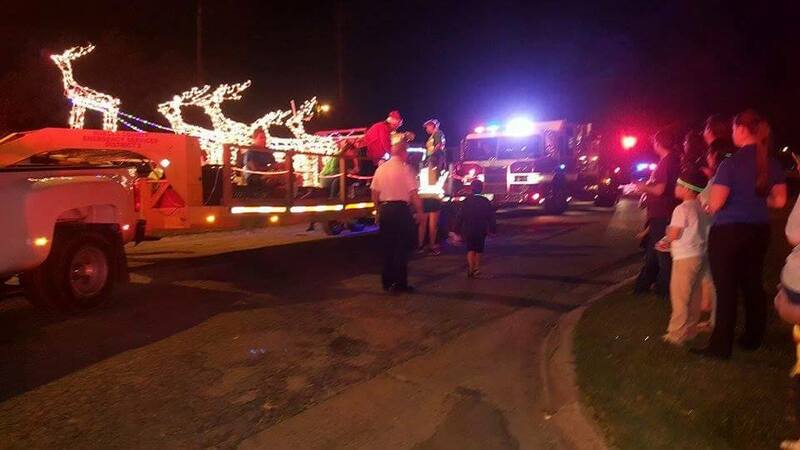 Seasonal events give everyone something to anticipate. 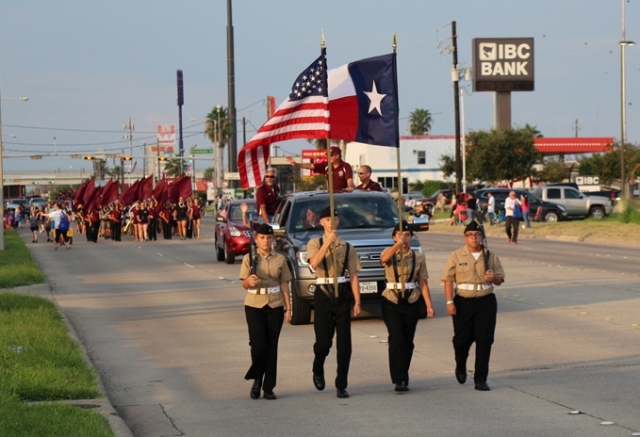 Whether it’s the Navy hosting the Blue Angels, the Flour Bluff Homecoming Parade, the Flour Bluff Business Association Community Christmas, the Flour Bluff Fire Department Santa float, or the Flour Bluff 8th-Grade trip to HEB Camp in the Hill Country, those who know Flour Bluff, know it has a host of unique offerings for the community. Maybe it’s a school that’s excels in everything. 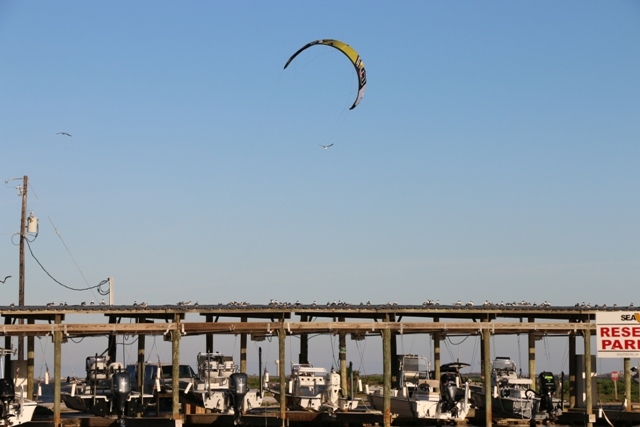 Maybe it’s the year-round great weather conducive to outdoor activities like fishing, boating, swimming, and surfing. Maybe it’s the tight-knit community that welcomes people from all over the world to be a part of what is happening here. Maybe it’s the rich history or unique geographical location. Maybe it’s the class reunions, Friday-night football, or visiting with old friends in the grocery line. Whatever it is, Flour Bluff is a great place to live, visit, play, raise a family, and take part in a community that is like no other. 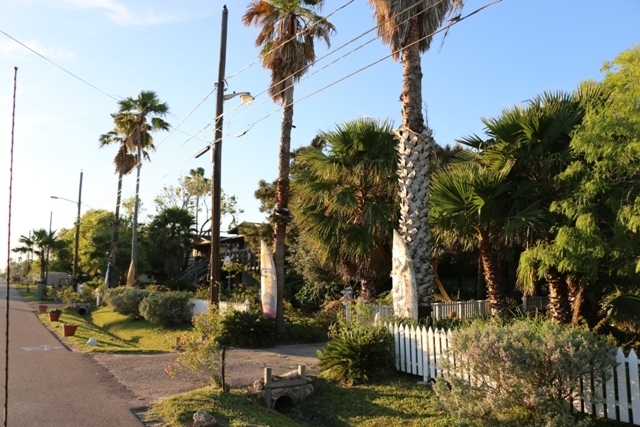 Spending the weekend with childhood friends (Flour Bluff Class of ’76), driving the Bluff in search of what is new or changed, writing this article, and gathering pictures for it takes me to the heart of a place I have called home for nearly 50 years. Even those who have moved away still feel her tugging at their heartstrings. She definitely leaves an impression. Flour Bluff, like every little “town”, has its problems, but that which is good outweighs them all. I just wish more people could experience living la vida Bluff style! 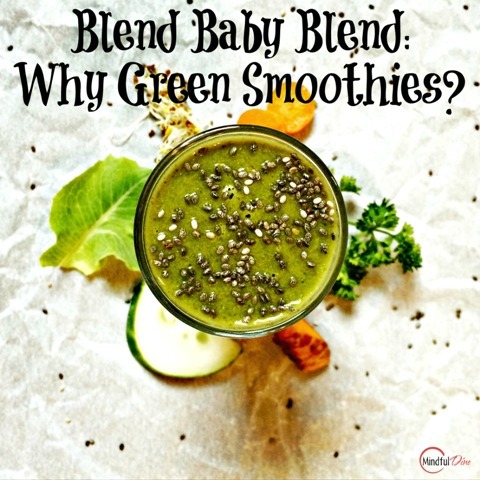 Blend Baby Blend: Why Green Smoothies? Smoothies (especially green ones) are a hot topic in the health world right now. Honestly, I cannot say enough about these creamy, satisfying concoctions. Why all the hype? Should you consider adding them to your menu? Are smoothies just a trend or are there real health benefits involved? Let’s break it down, starting with a simple list of why smoothies can be a very nutritious option! Most of us awake quite dehydrated in the morning, and smoothies can provide an amazing blast of hydration after a night of sleep. They are also a fabulous way to ease your digestive system into motion for the day, supporting your body with consistent fuel and energy. In my opinion, making a smoothie is the simplest way to include a diversity of whole food ingredients effortlessly into my diet, especially vegetables (and who doesn’t need that?)! The combinations are endless, using different fruits, leafy greens, herbs, healthy fats and various protein sources. You can flood your body with amazing nutrition and satisfy your taste buds simultaneously. If your children won’t touch anything green, smoothies are a magical way to sneak veggies past their palates. Trust me, they won’t taste the spinach that you blended into that delicious raspberry smoothie. Now, keep in mind, there are certainly ways to turn this healthy option into one that can cause inflammation and blood sugar imbalance in your body, like sugar-loading with too much fruit and not enough vegetables. For any new passengers on the green smoothie train, here is a simple 4-step “how to” to get you started. #2 Fruit and veggie time! Slowly increase the amount of vegetables over time, eventually aiming for a 3:1 ratio of veggies to fruit. #3 The Extras… protein, superfoods, and fats! Choosing a protein powder can be quite overwhelming, as there are so many available these days. Try to avoid genetically modified ingredients (GMOs), fillers, and heavily processed soy protein (like soy protein isolate). My preference is a plant-based protein with some dehydrated greens mixed in. Nut butters, like almond, peanut, cashew, or walnut. Buy organic when possible and read the ingredients, avoiding any added oils and sugars. Healthy fat options include chia seeds, flax seeds, hemp seeds, shredded coconut, and coconut oil. Take your smoothie to the next level with super foods (cacao, greens powder, maca, spirulina, goji berries, cinnamon, aloe vera, Matcha green tea, turmeric, or ginger). #4 Blend, and enjoy the goodness! Any quality blender will do, but a high-speed blender works wonders! The Vitamix is my go-to, but there are several quality blenders on the market now. Let’s put this knowledge into practice with a tasty, nutritious smoothie recipe. 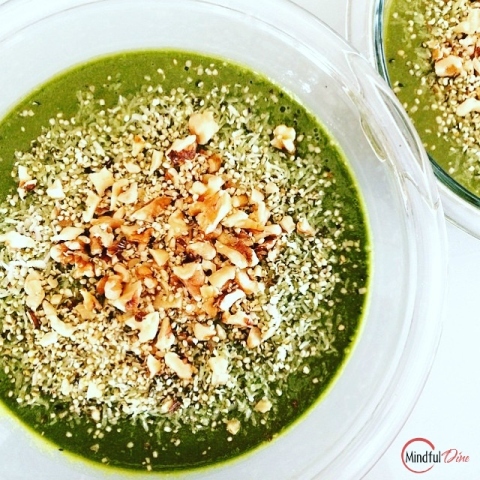 Be sure to scope out Mindful Dine for more smoothie inspiration! “Namaste,” I whisper as I bow my head to the floor. I wipe the sweat from my brow and eagerly roll up my yoga mat. 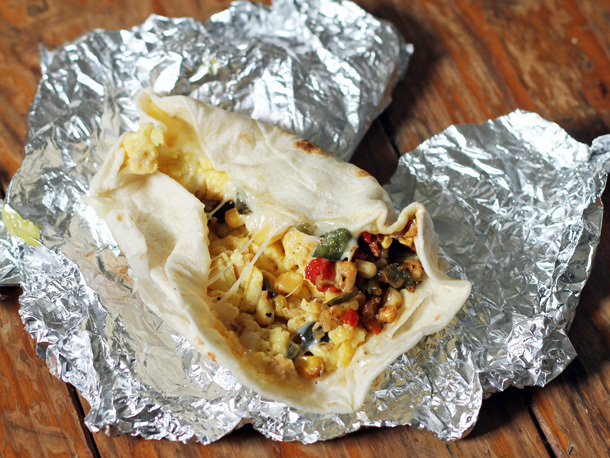 It’s Saturday morning, and my stomach begins to growl as it anticipates our weekly ritual. A 90- minute vinyasa class at Yoga Yoga followed by a walk around the corner to the beloved Austin staple, TacoDeli. I don’t even have to wait in line since I proactively phoned in my order on the way to class two hours ago (the lines are atrocious after 10 a.m. on the weekends). They know to have it ready for me promptly at 10:15 a.m. Yes, I’m the person who has restaurant phone numbers saved in my cell phone and is greeted by name when the employee answers. I have my priorities, people. I know what I am, and I am at peace with that. Now, just give me my tacos. Some foodies live by the mantra of “trying something new” every time. I, on the other hand, stick with what I know and love. This week is no different. A “Vaquero”(grilled corn, roasted peppers, and cheese on eggs) and a “Jess special” (migas, eggs, and jack cheese) on corn with a cup of coffee – black. 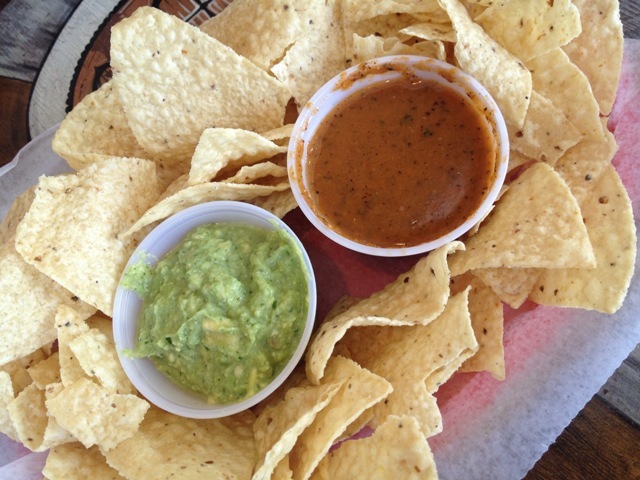 Oh, and did I mention my mild obsession (pun intended) with TacoDeli salsas? Not only did I ask for an extra side of salsa to go with my tacos, but I went for the whole shebang and ordered two large to-go tubs with chips. Yep, that’s right. Two tubs. Roughly 32 ounces of pure bliss in Tupperware. I figure it won’t go to waste, and my hubby and I can snack on it through the week. Ahem. Okay, maybe it’ll last us a few days, but you get the point. Close family and friends know that half the reasonI exercise on a regular basis is to offset my caloric intake. 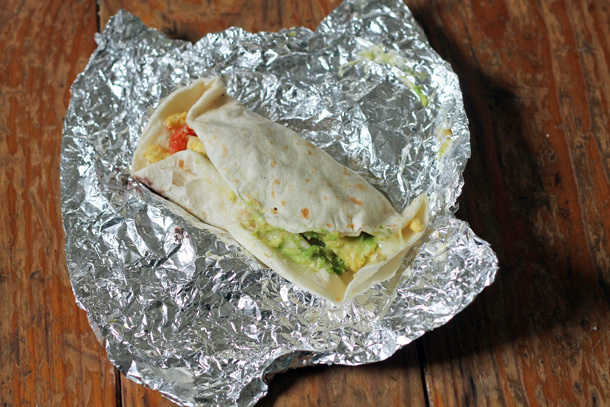 Life lesson #1, if you want to eat your tacos, you must exercise. It’s that simple. Or, you can starve yourself the rest of the week, but I prefer the former over the latter. As I take a sip of coffee and unwrap my first taco, I finally take a moment to look around the restaurant and take in my surroundings. It’s the usual weekend crowd, young twenty-somethings nursing their Friday night hangovers with tortillas, parents feeding their soccer uniform clad seven years old, and fellow yogis and cyclists hungry for organic coffee and locally sourced Vital Farms eggs. I start to feel guilty for a moment – here I am, sitting quietly in a bar-top stool, able to read my emails and peruse Instagram in peace. I think about my sister-in-laws and friends with kids, and how different their Saturday mornings are from mine. I would count my blessings to spend my weekend mornings with my own little ones, eating tacos over milk and coffee. But for now, this is my life and the path I have been blessed with. There have been some Saturday mornings when I engage in this ritual and catch a brief admiring gaze of a mom as she attempts to coax her baby into eating a bite of beans. She looks up at me and sees a woman, about the same age, garbed in Lululemon yoga pants, drinking her coffee and eating her tacos in peace. What she doesn’t know, is that maybe, just maybe, she was looking at a woman that struggled for years to get pregnant and have a baby of her own. Life lesson #2, the grass isn’t always greener on the other side. I know the statement is overused and at times, cliche, but whoever came up with that saying knew what they were talking about. Kudos to you, mystery author. And so for today, I feel nourished in the fact that I can do vinyasa, drink coffee, and eat tacos on my own accord. And so, as I finish the last bite of my avocado and eggs, I smile to myself. I remember the most important life lesson of all from my Saturday morning rituals. When the monotony of life gets in the way, you should just eat tacos and salsa (and do yoga). 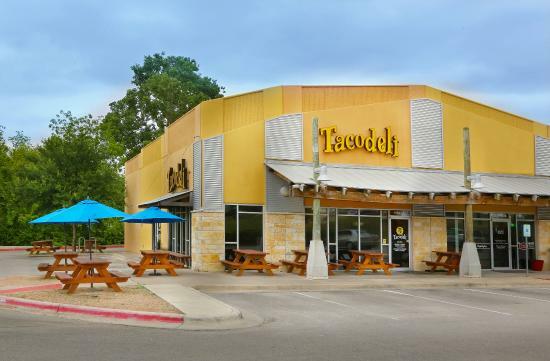 TacoDeli is an Austin staple, and frequented by locals and tourists alike. They are known for their four award-winning salsas. Each flavor has won first place in the Austin Hot Sauce Festival. You can check out more on the salsa recipes here. All of the tacos are handcrafted daily, made with the highest quality ingredients. The eggs are sourced from local Vital Farms, and all of the chips and corn tortillas are made from organic masa. For breakfast, try the house favorite Otto (beans, bacon, avocado and jack cheese) or vegetarians can feast on the El Popeye (eggs, spinach, and queso fresco). For lunch, don’t miss out on their daily specials, including the DeliBelly (pork belly, avocado, cilantro, onion with honey tomatillo-serrano salsa) or Tikin XIC (achiote marinated grilled salmon with habanero onion escabeche). Five locations in Austin and one location in Dallas make it easy to stop by on your visit. Bon Appetit! What can I say? I love to cook, eat and travel! This blog is dedicated to my passion for food and good conversation. Bon Appetit! “Is this floor pillow still good? It looks like it’s gone flat.” my husband gestures to the sagging foot rest as I’m preparing to leave for my girls’ day out. I give a distracted reply as I throw on my scarf and grab my purse. “For the record, it’s called a pouf….not a pillow. It just needs to be fluffed since the kids have been jumping on it.” He shakes his head in disapproval with a look that lets me know his desire to send the pillow straight to pouf heaven. I give him my best smile, then head for the door. My husband, the ever-changing actor and artist, is patient and tolerant of my obsessions with HGTV and the Food Network. He has come to recognize my first-name references to my favorite chefs (Ina, Giada, and Nigella to name a few) and my foodie television show acronyms (Who doesn’t call Diners, Drive-Ins, and Dives “Triple D?”). He doesn’t even flinch when I make reference to home decorating tips from Chip and Jojo (Gaines of HGTV’s Fixer Upper), as if we were lifelong friends. Today is no different as I embark on a 90-mile trek to Waco, Texas, to do what I love most: eat good food and discover inspiring places in the company of friends and family. It is my joy and passion to explore off- the-beaten-path spots and rejuvenating spaces with the people I love most. And so it begins….a blog to share each of these adventures. It’s the Wednesday after Christmas, and my dear friend Erin and I park promptly at 11:00 a.m. in the dirt lot off of Webster Avenue in downtown Waco. 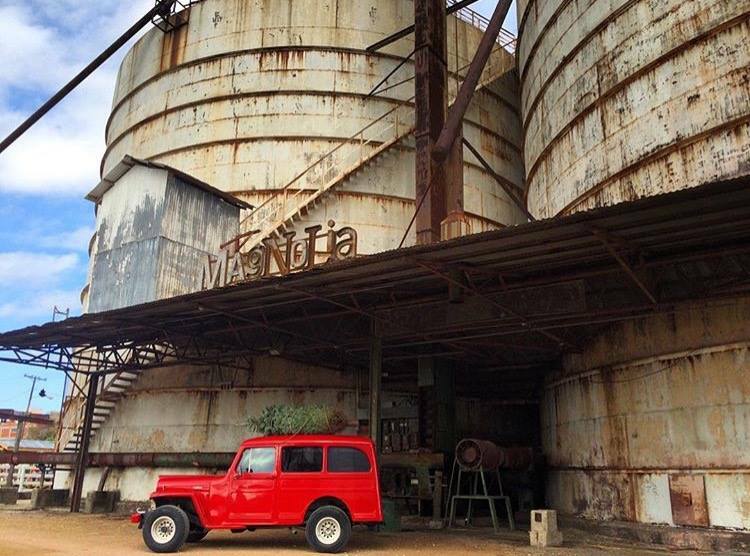 We join the rest of the devout followers of HGTV’s Fixer Upper show and make the short pilgrimage to the Magnolia Market Silos property about a quarter of a mile away. 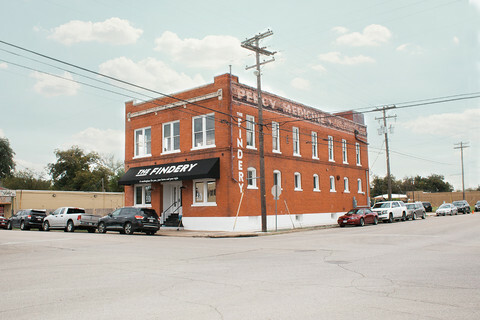 The property originally served as an old grain depot, and in late 2014, the couple (who work in tandem as a construction and home redesign team) purchased and renovated the property. It’s only an hour after opening and the hustle of loyal fans fills the air. On our right, sit two large grain silos. The flagship storefront is to the left, and in front of us, a large food truck park with a green space covered in turf grass. It is obvious that the property was not only intended to cater to eager shoppers but their families as well. Just past the common area is the working garden. 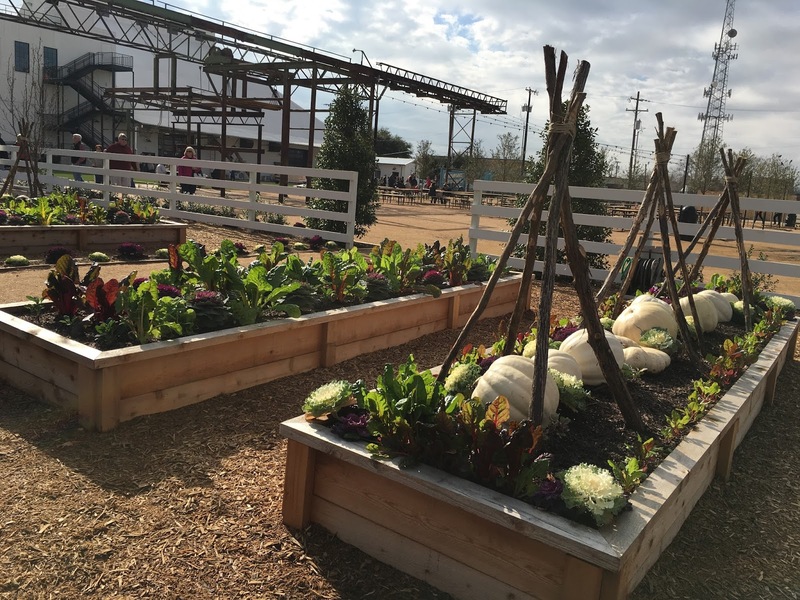 Raised planter boxes create a pathway of flourishing plants including a rainbow of Swiss chard, cabbage, and kale. Visitors can stop and take pictures in front of the barn and escape the bustle of the shoppers. 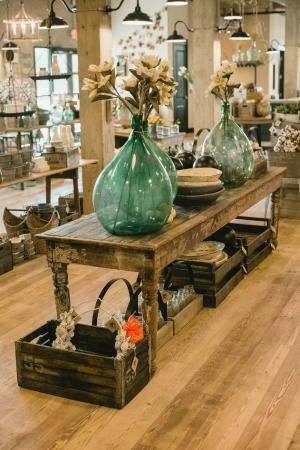 The flagship store showroom includes elegant displays of Jojo’s home decor, including Magnolia Market candles and coffee mugs, vases and oodles of trays and baskets in every size and shape. Other sections of the store include apparel and local artisan jewelry. “Chip’s Corner” is a space filled with gifts for the modern day man such as toothbrushes and pocket tools. The sale section of the market is connected by a set of stairs that lead to the attached grain barn. The drafty area has a rotation of products that have been marked down in price. 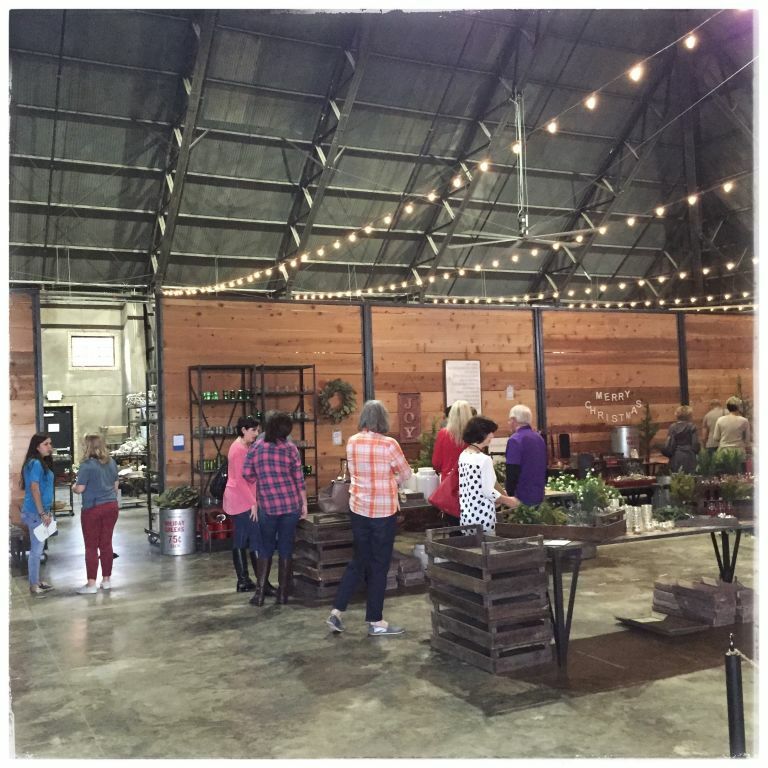 Magnolia Market is an inspiring venue that provides design enthusiasts with decorating ideas. If you’re looking for a beautiful space to be inspired, grab a cup of coffee, or get a bite to eat, then this is an experience you won’t want to miss. To avoid the massive shopping crowds, visit on a weekday (preferably not over a holiday) shortly after opening. You will be able to get in and out of the market before the crowds begin to wrap around the street corner. Since merchandise prices are generally affordable (but not cheap), a devout Fixer Upper follower would be better off taking pictures of the staged decor and visiting the unique boutique around the corner called The Findery to emulate the ideas. Aside from Magnolia Market signature items, The Findery carries similar home decor and apparel items, for a more reasonable price. 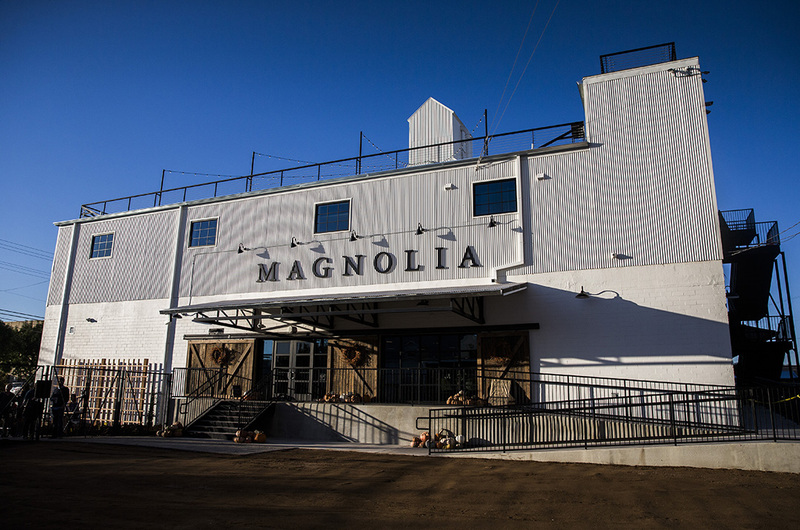 Lastly, be sure to wear comfortable walking shoes on your trip, as you will want to explore all of the open spaces that Magnolia Market Silos has to offer. Happy hunting! 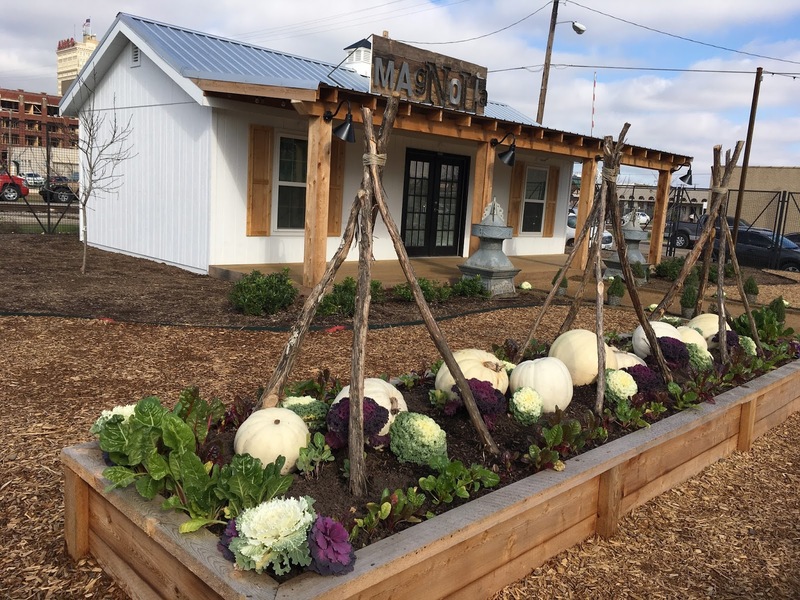 As we ventured past the snaking line of visitors awaiting to enter the Magnolia Market, we could no longer ignore the grumbling of our stomachs. Anticipating the afternoon traffic on I-35, we decided a late lunch in downtown Georgetown (just north of Austin) would be an ideal location. A little under an hour later, we settled in at a booth at the Monument Cafe. 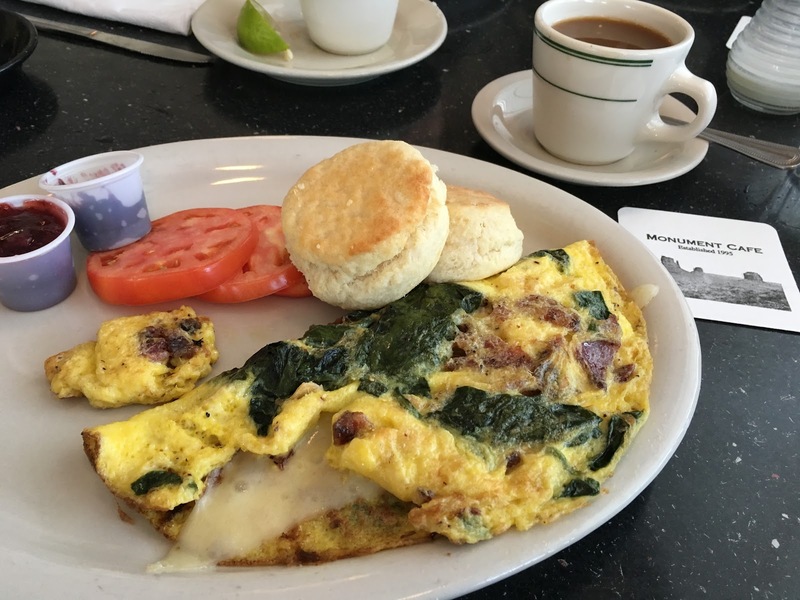 Locals fondly refer to the cafe as simply “The Monument.” As referenced on the front page of the menu, the diner is a tribute to rural Texas cafes that served simple yet satisfying food and served as community centers for the towns in which they were located. The diverse menu includes home-style favorites such as fried chicken, liver and onions, burgers, salads and soups. Breakfast aficionados will be pleased to find that breakfast is served all day. Freshly baked biscuits with butter and housemade blackberry preserves (yes, please!) greet customers as they are seated. 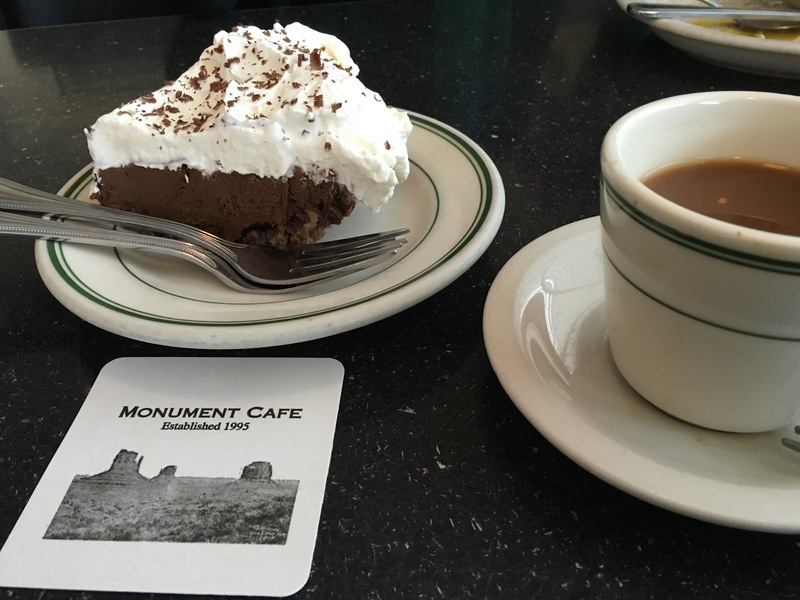 I polished off a three-egg omelet with bacon and spinach, then followed it up with a slice of the Monument Classic Pie. The pie was every bit delicious as it was beautiful. Organic dairy, pastured eggs, and local pecans filled every bite. 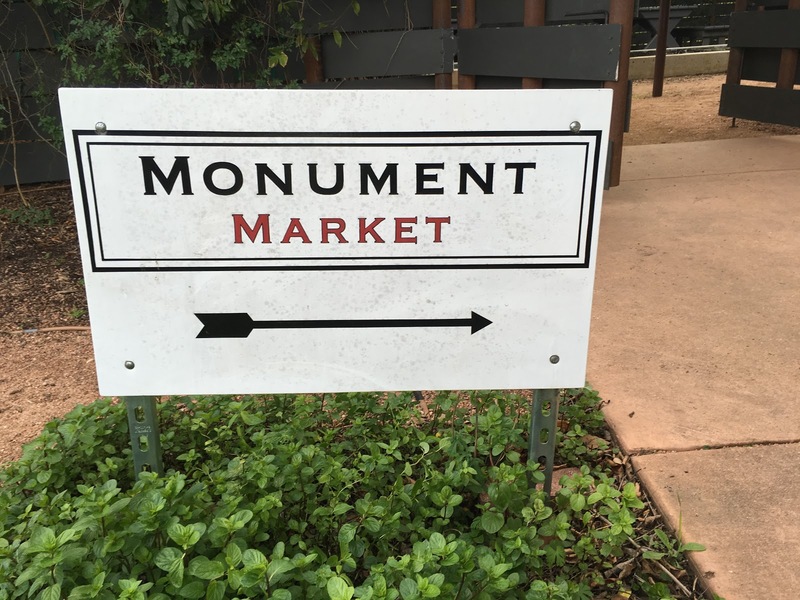 Upon closing our tab, the waiter encouraged us to visit the attached Monument Market. As we entered through the glass door, we were greeted with a surprisingly diverse and well-stocked shop of groceries and gifts. 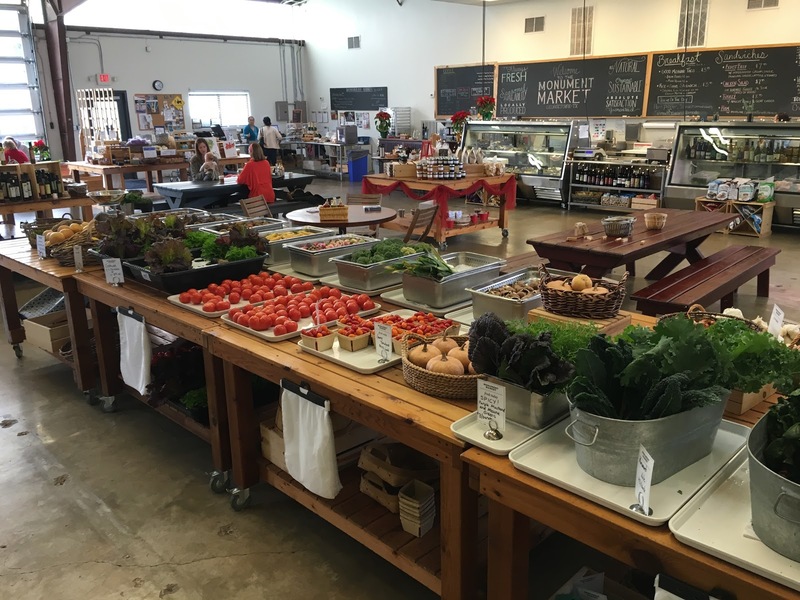 Fresh produce, a wall of wine and beer, house-made granola, and baked goods lined the shelves. The back wall offered a case of prepared foods, meat and eggs. 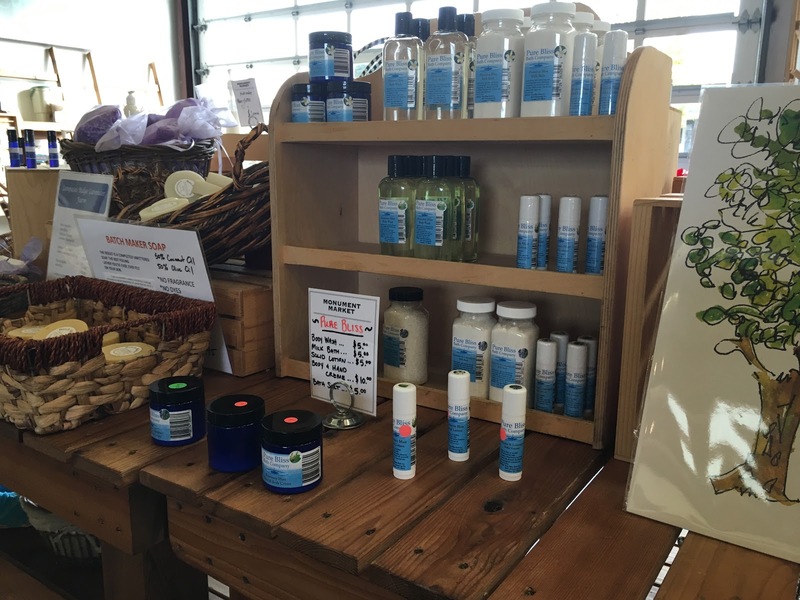 Picnic tables provided a spot to enjoy purchased treats, and the surrounding tables offered a variety of preserves and all-natural lotions. Tucked away in the back corner of the market was a wall of organic gardening and pet products. As I made my purchase of local honey, I spotted the adjacent outdoor biergarten. It is a perfect spot to enjoy a glass of wine or a cold brew on a warm summer night. Our last stop before the car was a quick walk through the cafe’s garden. 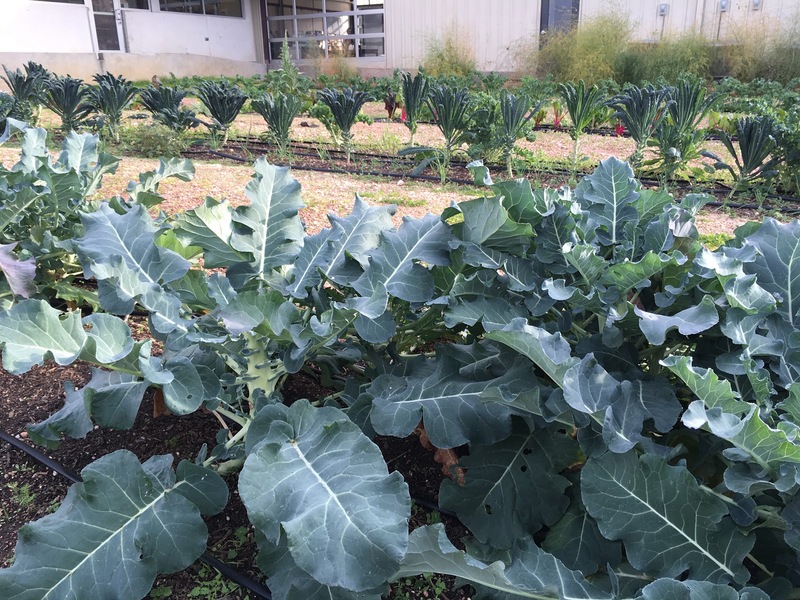 Even in December, the crops were abundant and flourishing. 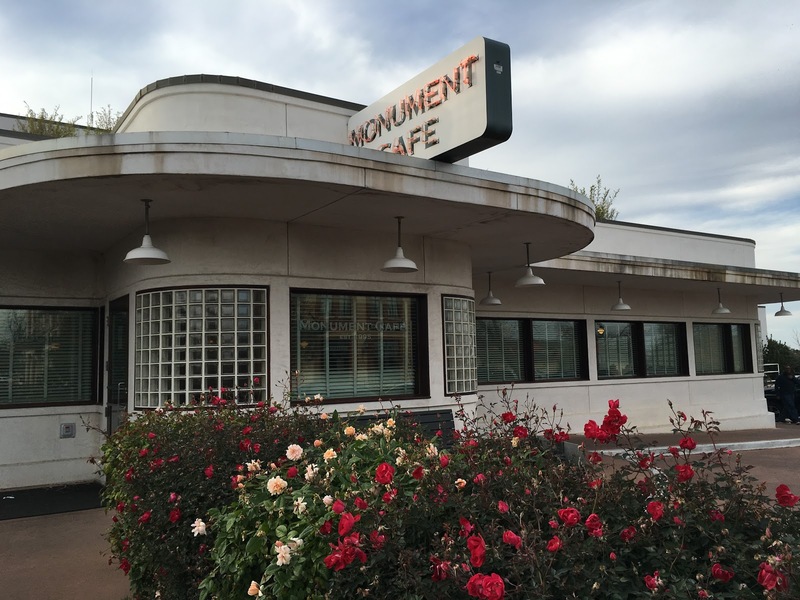 The Monument Cafe, referred by locals as simply “The Monument,” pays tribute to rural Texas cafes that served simple yet satisfying food and served as community centers for the towns in which they were located. The restaurant prides itself on serving fresh, local, seasonal, unprocessed, simple and flavorful food. The taste and quality of the dishes reflect the time and effort put into creating each dish in-house from scratch. The inviting interior pays homage to roadside diners, while maintaining a sleek and updated feel. Breakfast platters range from $6 – $10, and dinner entrees range from $8 – $17. 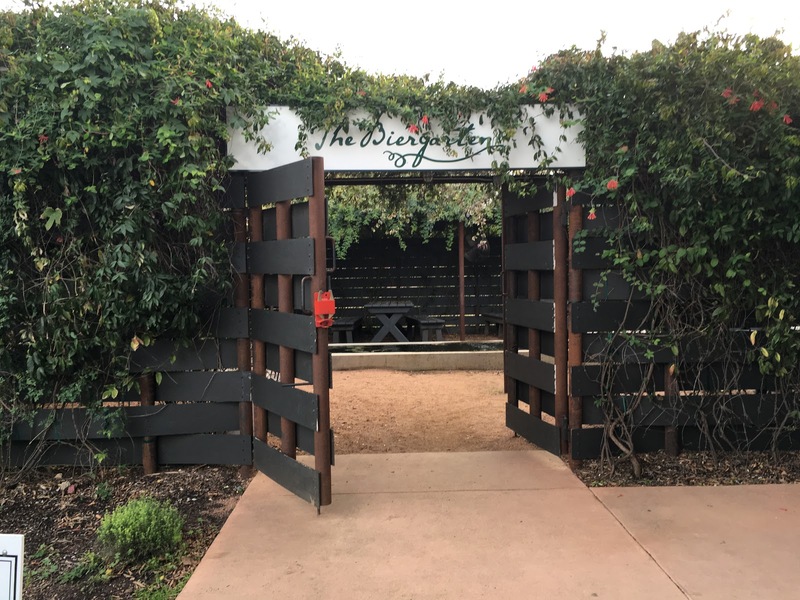 Parking is easy in the attached lot, and the cafe is walking distance to the downtown Georgetown square which includes wine tasting rooms, jewelry and fine gifts, antiques, home decor, and pet stores. Be sure to visit the adjacent Biergarten for a cold brew or glass of wine. On the weekends, you can order from the full cafe menu while listening to live music each night. 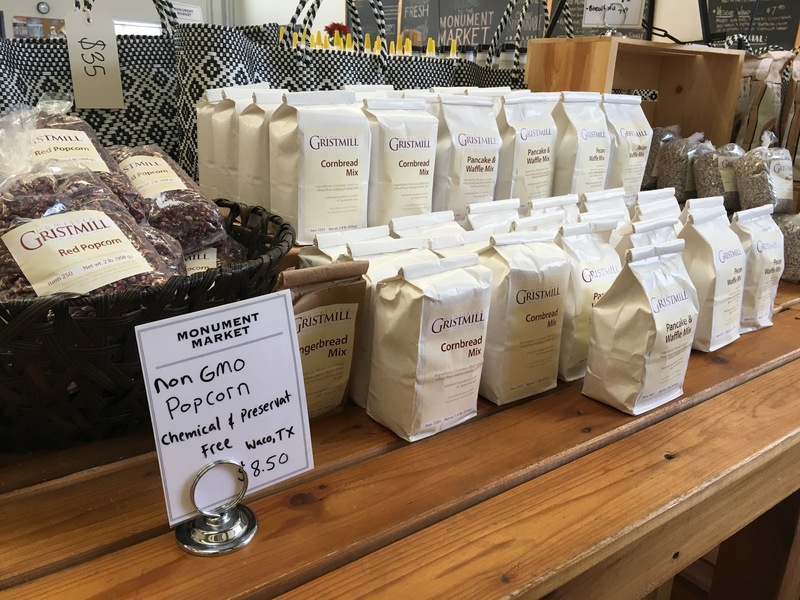 For high-quality gourmet fiends, visit the attached Monument Market and garden for fresh produce, all-natural dairy and cheeses, pastured eggs, organic vegetables and fruit, and Texas wines and artisanal beers. 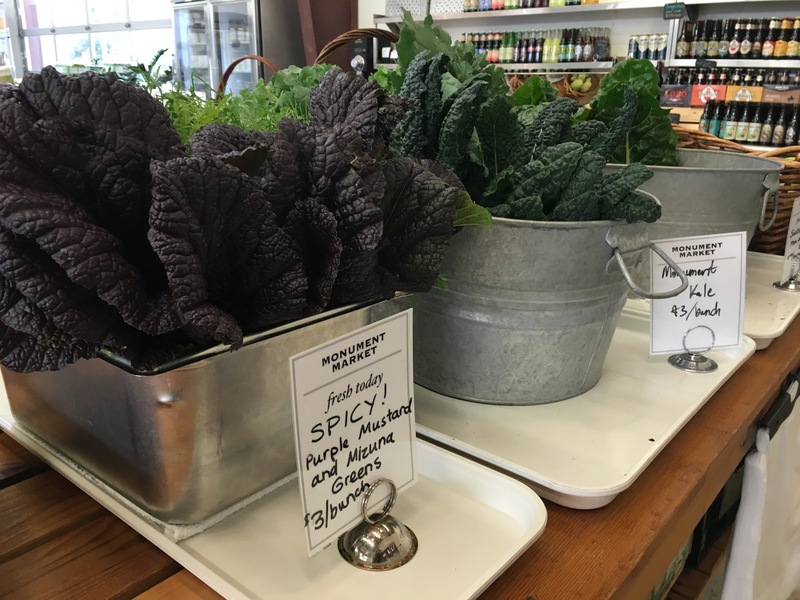 The cafe prides itself on local and seasonal food direct from the source. 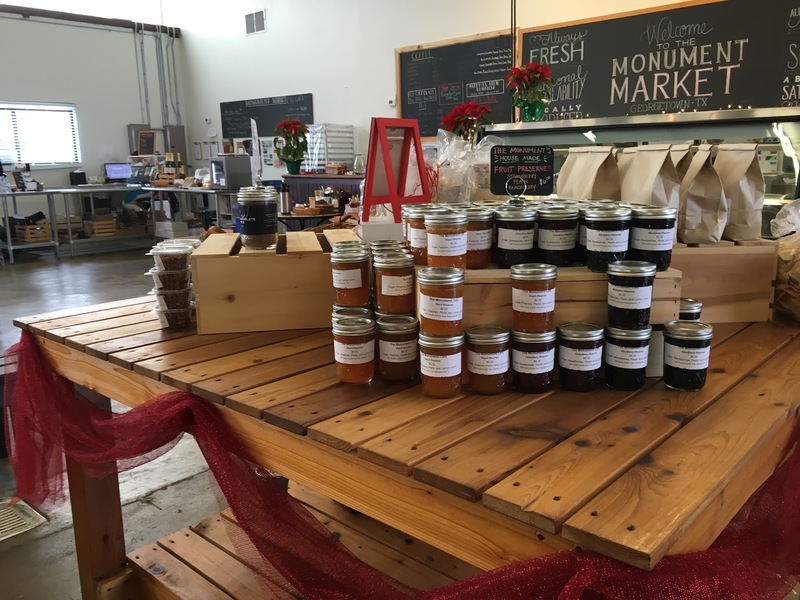 Be sure to pick up a bottle of local honey or gardening products to take home. Bon Appetit!